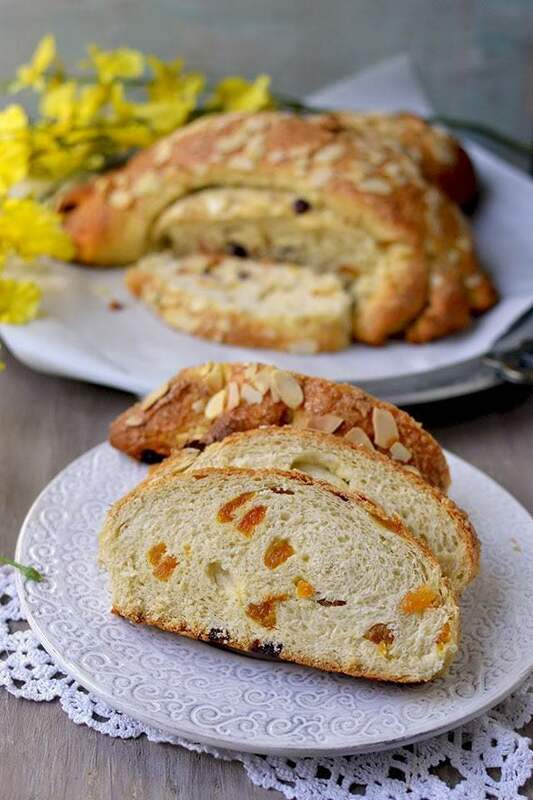 Colomba Pasquale is a traditional Easter bread made with flour, eggs, sugar, yeast and butter. It is fashioned into a dove shape (colomba in Italian) and then topped with pearl sugar and slivered almonds before baking. It is very similar to it's Christmas counterpart, the Panettone. It is flavored with candied peel. Make the Biga: The night before making the bread, mix together the biga ingredients, cover the bowl and set aside for up to 15 hours at room temperature. To make the Dough: Biga will be quite bubbly in the morning. Combine the biga, flour, yeast, sugar, salt, butter, eggs (egg replacer mixture), fiori di sicilia and mix to combine. I had to add 2~3tbsp water to get the dough to come together. Knead the dough with the dough hook for 12 minutes, by this time dough will be soft and satiny. Knead in the orange zest and dry fruit. Cover and set the dough aside for 3 hours. By this time, dough will be very puffy. Gently deflate the dough and divide into 2 pieces -- one slightly bigger than the other. Shape the pieces into 10" and 7" long logs. Taper the 10" log on one side. Lay the shorter log crosswise across it, right at the crease. Shape the shorter log into 'wings' by pulling it into a crescent shape. Flatten the tail and the wings, then using a sharp knife or scissors to snip 'feathers'. Place a whole almond for an eye. Prepare the Topping: Combine soymilk (or the reserved egg white), almond meal and sugar in a small bowl. This will be a thick glaze. Brush it on the dove liberally. Sprinkle the almonds and pearl/ coarse or demerera sugar on top. Bake for 15 minutes. Then lower the oven temperature to 350°F and bake for 20 additional minutes. For the last 10 minutes, loosely tent the bread with an aluminum foil to prevent over-browning. By the end of baking time, bread should be golden brown and the internal temperature should be 190°F on an instant read thermometer inserted into the center. Gently move the bread onto a wire rack and cool completely before slicing.